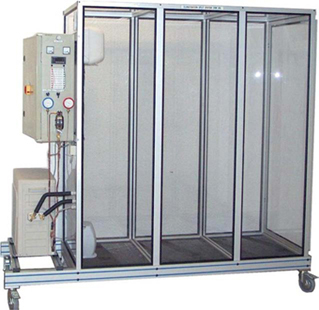 The unit is made up of two parts: the first consists of the condensation unit and the second consists of the evaporator. It can be placed into a closed chamber, which simulates a room that is to be air conditioned. The components are of industrial quality. The instruments found on the unit allow for the measurement and the adjustment of various parameters. The unit is delivered complete with instrumentation and with a technical and instruction manual. Study of a SPLIT SYSTEM air conditioning system.